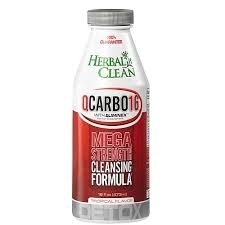 Herbal Clean 16 oz. QCarbo is a potent, easy-to-use cleanser, and the #1 Detox product on the market today! Cleansing is beneficial prior to any diet and exercise program. It can additionally aid in offering a sense of general satisfaction and well-being. Today's lifestyles include numerous pollutants from many sources including air, food and water. When eliminating toxins, it is important that you do it safely and with peace of mind. QCarbo is the original cleansing drink that acts as a potent deep cleansing formula; one that you can rely on. Step 1: Drink the entire contents of the bottle. Step 2: Refill the bottle with water and drink at a comfortable yet consistent pace. Step 3: Be sure to urinate frequently; this is a part of the elimination process and very important to a successful cleansing program. If you desire, additional consumption of water can be helpful. Some Important Hints for you to keep in mind: - When cleansing the system, it is important to drink as much water as possible on a daily basis. - Do not use any over the counter drugs, large quantities of vitamins, alcohol, acidic liquids such as vinegar or juices, nicotine, caffeine or other unwanted toxins prior to the use of this product. - Do not eat any large meals before using this product.